The idea of altering compression ratios to improve both power and efficiency of an internal-combustion engine isn’t new. Just ask the engineers at Infiniti who pulled a 20-year-old concept off the shelf, developed it to production-level over several years in the 2.0L VC-Turbo 4-cyl. and now see it introduced in the Infiniti QX50 CUV. Pound the accelerator in the QX50 and prepare to be surprised. Nothing short of a burst of nitrous can prepare you for the sudden surge of low-rpm power from such a small-displacement engine. 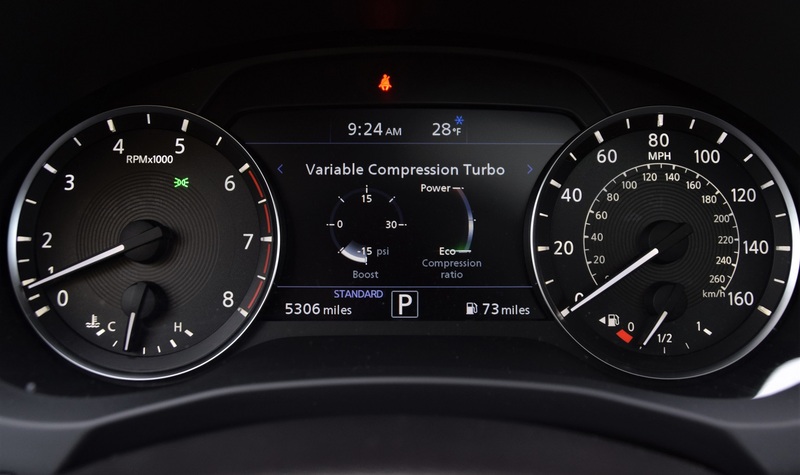 It’s mind-blowing what’s happening inside the QX50’s variable-compression turbo engine: Using a patented multi-link device between the rods and the crankshaft, the VC-Turbo actually shortens the length of the piston stroke, modifying the compression ratio from 14.0:1 to 8.0:1, depending on load and demand – all while the engine is running at speed. Under hard throttle and peak demand, the switch to low compression comes on like a kick in the pants, with the 268-hp engine delivering 280 lb.-ft. (380 Nm) of torque at a mere 1,600 rpm. It feels a lot like Honda’s patented high-rpm i-VTEC valve management but comes on at a much lower engine speed. Turbo lag is virtually non-existent. Additional technology in the all-aluminum engine includes direct and port fuel injection, the exhaust manifold integrated into the head, mirror-bore cylinder coatings, a variable-displacement oil pump and variable valve timing – electric on the intake side and hydraulic on the exhaust valves. The net effect is an engine with the power of the 3.5L V-6 it replaces, but with a 27% gain in fuel efficiency, all in a responsive, high-performance package. In our testing, an engine rated at 24/30 mpg (9.8-7.8 L/100 km) city/highway produced 25-26 mpg (9.0-8.7 L/100 km) in everyday driving. Good luck finding another 4-cyl. turbo capable of the same output, responsiveness and excellent fuel economy in a vehicle this size. The best news? The VC-Turbo debuted in the premium QX50, but parent company Nissan already has introduced the engine in the popular Altima sedan. We expect the technology ultimately will be standard issue on many Nissan and Infiniti models to come.